Brenda Hounam, a mother of two, has Alzheimer Disease. When Brenda went to St. Thomas, Ontario in January 2004 to speak about how this disease had affected her, she spoke openly of her sadness at the thought of being unable to recognize her own son and daughter and especially of the pain and suffering this would cause them. A music lover, Brenda thought a song would be the best way to remind her children of her love for them. By a stroke of fate she met Sara Westbrook, a singer and songwriter from St. Thomas. Sara contacted fellow songwriters Andrew Ang and Matthew Tishler, and with Brenda's blessing, the trio wrote One More Memory. Written from the perspective of a person with Alzheimer Disease, One More Memory continues to touch hearts, helping loved ones cope with this disease's unpredictable symptoms. Andrew Ang approached Kenneth Young Design to develop an enhanced CD for One More Memory. We included the story behind the song, photos and bios of the musicians and songwriters, and a "behind the scenes" video. The design of the CD's interface was coordinated with the design of the CD cover for a seamless finished production. Kenneth Young Design also provided technical assistance with the development of the One More Memory website. To find out more about the project, please visit www.onemorememory.com. If you would like professional multimedia development for your next project, contact us for a free quote. 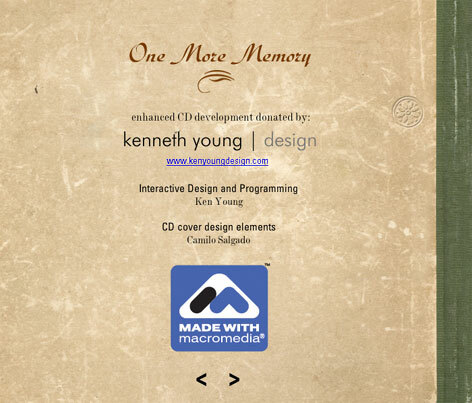 "Kenneth Young Design made a very generous donation to the One More Memory Project with their end-to-end development of our enhanced CD. Their level of multimedia expertise allowed them to put together an outstanding product on a tight schedule. The finished CD was polished in every respect; it featured integrated audio, video, photos, and smooth transitions between sections, worked flawlessly on both Mac and PC, and integrated perfectly with our existing package design. On top of that, they even helped us with some technical aspects of our website development. I would definitely recommend them to anyone looking for highly competent, professional multimedia development."